I rode the Magna up the Angeles Crest Highway. 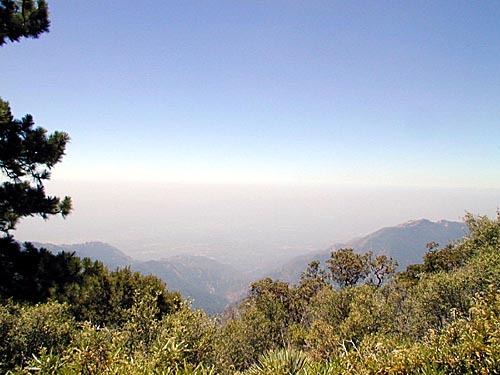 The excuse was to visit the Observatory at the summit of Mt. Wilson. Here is what I found. Antennas! Mt. 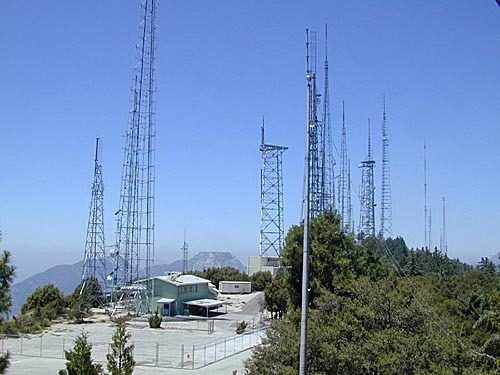 Wilson is perfectly situated to overlook the entire Los Angeles area, so virtually every broadcaster transmits from this hilltop. 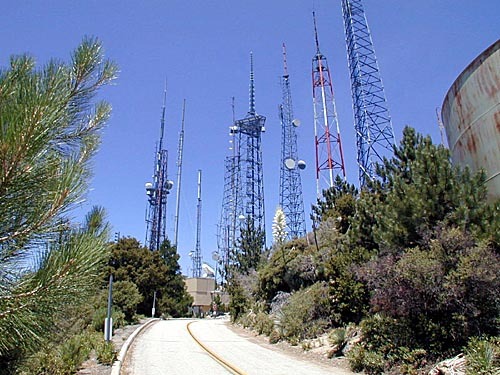 It's a relatively pointy hill for southern California, so all the antennas are crowded into one small region. 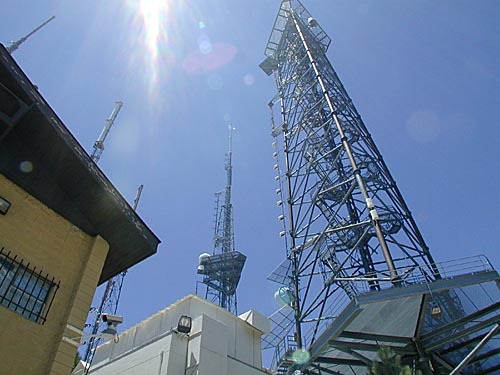 Seen here are only a few of the many towers around the hilltop. Here's the view. It would be a lot more impressive on a clear day. 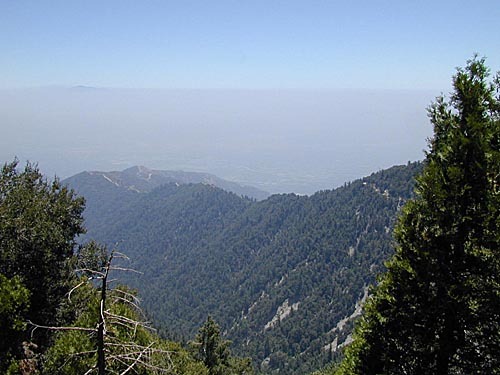 Mostly what you see here is smog. Looking up at some antennas. These towers are BIG. 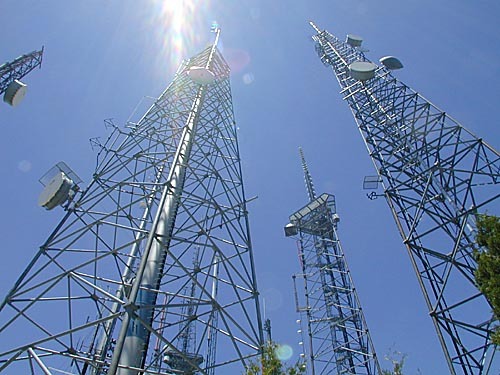 More antennas. The polygonal gray thing in the lower right is, I believe, a shield intended to protect people and vehicles on the ground from ice falling from the tower. For scale, look at the zig-zag members on the right tower. It's a full size staircase. You would NOT catch me climbing it, though. 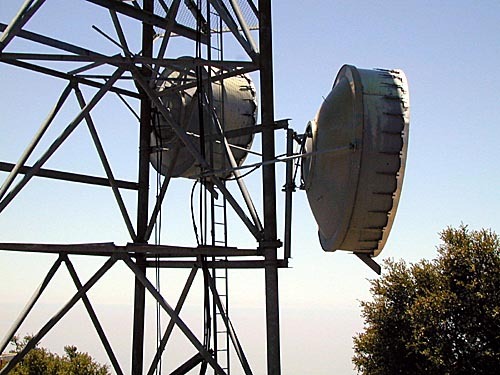 These microwave dish antennas are pretty big. Note the service ladder for scale. Ah, there's an observatory here too. I don't know why these instruments are on stilts. 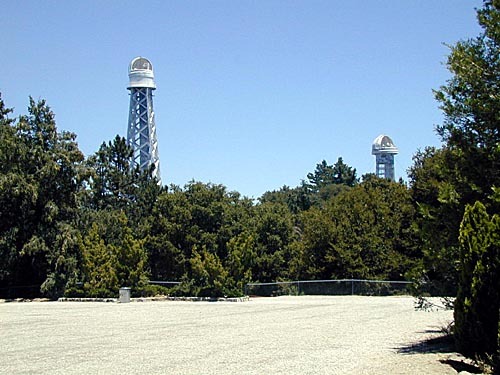 I didn't really get close to the observatory equipment, since the grounds were theoretically closed and I didn't have much time to explore. 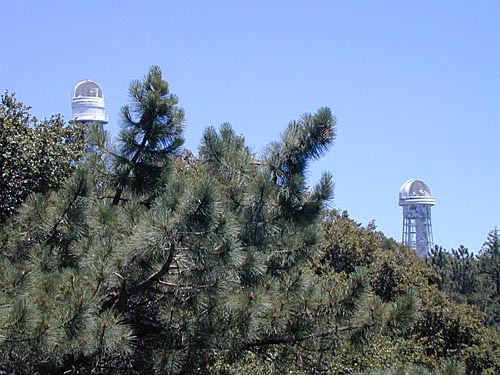 The same two telescopes from a slightly different angle. The domes are open, so they must be doing solar work. Another view off the mountain. Don't look, Ellen! 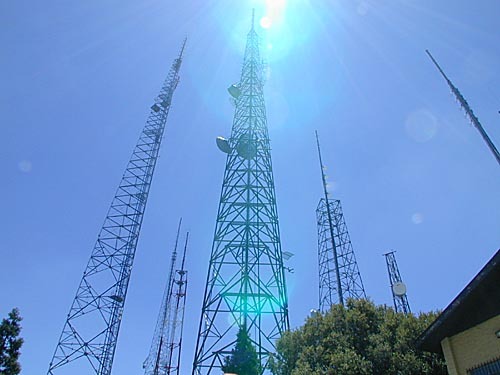 Here we see most, but not all, of the antennas on the hilltop. The paved area is on the observatory grounds. I'm not sure what it's for. Maybe a staging area for large experiments, or maybe some older instrument has been removed from there. The buildings probably house communications equipment. 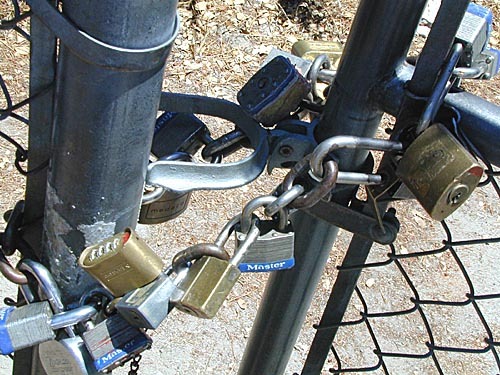 Recently I was trying to explain why/how you might have several padlocks on one gate. Here is a good example. Each of the companies and agencies that is authorized to access this site presumably has a padlock in this chain. There are so many padlocks here there is hardly any chain left.